There’s a lot of madness about the halls of the EOG lately, with Mansions of Madness inveigling its way to the table twice in two weeks. Remember to check the Library for more on Mansions of Madness—it’s an EOG favourite, with a rundown of the rules, a painting guide, and a suggested foamcore box insert configuration. This latest rules summary update includes the new expansion Call of the Wild. Now, let’s hear about last night’s adventure: Blood Ties (story #3 from the core set). By the way, for those playing this story, I highly recommend a small adjustment made by players on the Boardgamegeek forums—limit the Pyromaniac Keeper card to 6 uses only. Put 6 burning tokens on the card to keep track. Also, for the following game I started with story choices 1A and 2A (apparently objective 1B is ‘broken’). Warning: Spoiler Alert! Reveals some elements of the Blood Ties adventure. The uncle of private investigator Joe Diamond has recently died and Joe has come into his inheritance: an ‘estate’ dotted with a few half-built structures. He and his fellow investigators Sister Mary and clairvoyant author Gloria Goldberg, light a fire to keep warm and then, following the age-old adage ‘if we split up we’ll cover more ground’, Joe heads for the backyard shed, Gloria for the graveyard, and Sister Mary for the small house on the grounds. … these creatures had a pact with his dead uncle, a pact they intend to see fulfilled! Joe breaks the combination and enters the shed, grabbing a crowbar, but he hears a strange otherworldy, buzzing voice and a creature from nightmare, like a giant fly, crawls from a vent and somehow speaks to him through his mind … these creatures had a pact with his dead uncle, a pact they intend to see fulfilled! Joe is having none of it however, and refuses to make the same mistakes as his insane relative, instead bringing the crowbar down on the creature with all his strength. Sister Mary heads for the root cellar, and after deciphering the lock, manages to enter. The zombie shambles in after her and she manages to temporarily fight it off with the power of her faith (and a crucifix). After some exploration of the main building, Gloria runs through the grounds—and the rapidly spreading flames—to reach the door of small shack but it is only then that she realises that she requires a magical phrase to enter—a magical phrase that only Joe knows! Overwhelmed by flames and smoke, she collapses to the ground and dies. In the graveyeard, having fought off two of the alien creatures in the shed, Joe recalls a snippet of Latin that his uncle once taught him, and foolishly repeats it. In answer, flames erupt from the tombs around him, shooting stone gave lids into the sky! He runs in a semi-panic through the infero, surrounded by trees like giant torches and blazing shrubbery, and finally reaches the front yard and the mud room. Stepping over Gloria’s corpse and repeating the magical phrase, he enters and finds a silver key. At this point a new investigator arrives on the scene—Professor Harvey Walters. He immediately realises what is going on and despite his advancing years manages to make it to the underground cave through the spreading flames. His powerful attack spell shriveling is about to be put to repeated use. 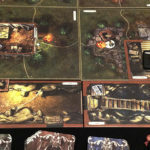 Finally, all three investigators are down the ladder into the cave. 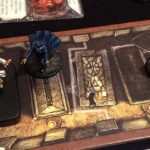 The focus of the activity seems to the nearby crypt, now accessible with the silver key—but before they can explore it further, and after fighting off several zombies, they attempt to clear the room of dead bodies so they cannot rise again to attack the investigators. It is ultimately a fruitless task—the crypt seems packed with an endless supply of corpses—but at least it buys them some time. Time, unfortunately, that is rapidly running out. Zombies keep rising from the sarcophagi as Joe and Sister Mary drag corpses up the ladder and dump them into the flames. Finally, Joe’s uncle Artimus steps from the shadows and proclaims his allegiance to his alien masters—all he requires for their gift of immortality is for three samples from the investigators, placed on the altar in a nearby room. Joe confronts him, but driven completely insane, finally dies at the hand of his uncle. The cackling Atrimus rips a third sample from the Professor as he runs past him—he now has three samples with which to appease his alien friends and thus finally gain his immortality! As he runs across a rickety bridge across a bottomless chasm, only Sister Mary has enough time to reach him. She raises her revolver, steadies her shaking hand, and fires—and the heart of Artimus explodes from the impact! He topples from the bridge and falls into the waiting blackness. The investigators are victorious! Now that was a Mansions of Madness game. Blood Ties is regarded as one of the best game scenarios (as long as you avoid one particular Clue combination) and it didn’t disappoint. The player playing Sister Mary needed a 1 on a d10 to shoot Artimus just two turns before the end of the game and one space away from a Keeper win—and he rolled it! You can keep your dry tallying of victory points—that’s how you end a game!